Your family deserves furniture that brings out the best in them, and with our 100% reclaimed wood dining tables, they’ll know they’re helping the planet every time they sit down to a meal. Not only are our tables environmentally clean, but they’re achingly beautiful. Each piece of reclaimed wood we use is unique, with its own pattern of grains and knots, and it ages gracefully. You could not find a better feature piece, so let your table tell the story of your family. 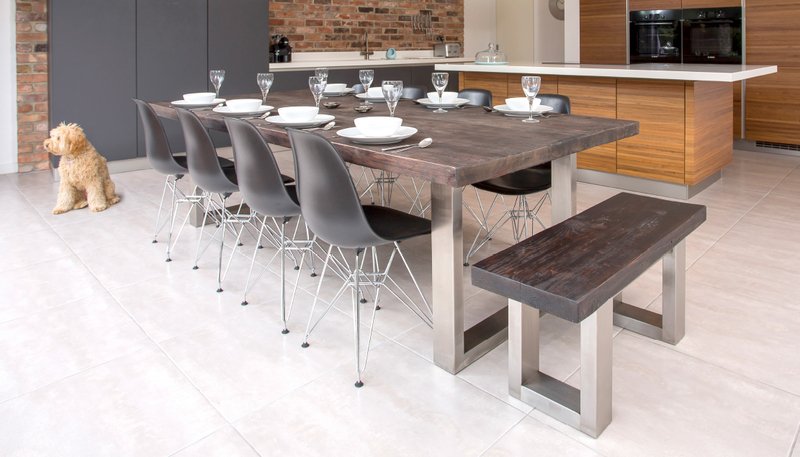 Our reclaimed wood dining tables are a wonderful addition to any space. The rustic warmth of the wood melts seamlessly into the décor of a classic country house. Alternatively, a pale knotty reclaimed wood can be used to make a dramatic statement when set against a contemporary minimalist interior. The possibilities really are limitless. Each table is prepared with the loving care and attention that any precious material deserves. The wood that we use comes from old-growth sources which have taken decades or even centuries to reach full maturity, meaning that this wood will be more dense and durable than other, more recently produced, materials. Perhaps it started off as a garden fence in the heart of the British countryside, a beach hut along some rugged, misty beach or maybe it came from a medieval church. Whatever the origin story of your utterly individual dining table, you can be certain that it will be as unique and as full of history as every person who gathers around it to join in a sumptuous dinner and to share their stories with one another. In addition to their stunning design, each table is completely eco-friendly. By refreshing and reinvigorating recycled material, we reduce the amount of wood that goes to waste every day. Our craftspeople carefully source each piece of wood before working their magic: cleaning it, smoothing away any cracks, holes, nails or anything that can splinter, and finally washing it with hard wax oil, preserving it for years to come. We transform it into something utterly new, breathing new life into every pore, every line and grain frozen in time for the rest of eternity. And all this just for you.